There are all kinds of kites flying in the sky, they are conveying happy information, bringing happiness and hope. Because scientific design and environmentally friendly and durable materials can provide safer, easy to fly, portable kites, allowing you to enjoy flight and performance. and more than 20 countries around the world, we are appointed as authorised suppliers around the world's hot supermarkets. ❤ Kid and adult dragonfly rainbow kites are made from high quality environmental nylon and fiberglass. They are lighter and more stable than those of traditional materials. ❤ Easy to assemble . You can assemble the kite in one minute (we have enclosed the detailed instruction) .It is a fantastic toy for travel and outdoor games. ❤ Professional design for stable flying. Children ,adults, beginners and professional person can fly this colorful 3d kite. ❤ 60x42 inches large dragonfly kite with long tail . It can be easily flied in any range of wind and keep flying stable. ❤ We promise a lifetime warranty ,if there is breakage or can't fly we will give you a full refund or free to change a new one. 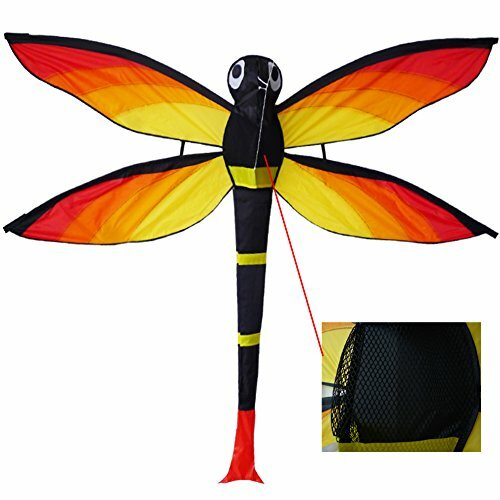 ❤MATERIALS & SIZE: 60X42 inches huge Dragonfly kite/ Kids Kite is made from high-strength rip-stop nylon fabric and solid flexible fiberglass .We make special reinforcement on the key place where is easy to be torn. ❤PERFECT DESIGN:The unique rainbow joint design with long length tail .Best wind range 6-20 m/ph. It can fly well and easily no matter in the breeze or high wind. ❤CONVENIENCE: The package of this huge rainbow dragonfly kite is easy to carry and assemble. You can fly it stable in few minutes. You can put it in suitcase easily. It is very suitable for travel. ❤BEST PRESENT: Kids and beginners can gain perfect flying performance either on the beach or park or any open areas. You can choose this high quality kite as a birthday gift or Christmas gift for your kids or friends or family.This kite is the best choise. ❤FULL REFUND: Our factory take each customer's complaints and suggestions seriously. We constantly improve our quality and firmness. We promise if there is the breakage and not flying condition, we will give you full refund and free to change a new one. If you have any questions about this product by ZHONGRAN, contact us by completing and submitting the form below. If you are looking for a specif part number, please include it with your message. 3D Blue Angel SV, 46" x 35" x 14"